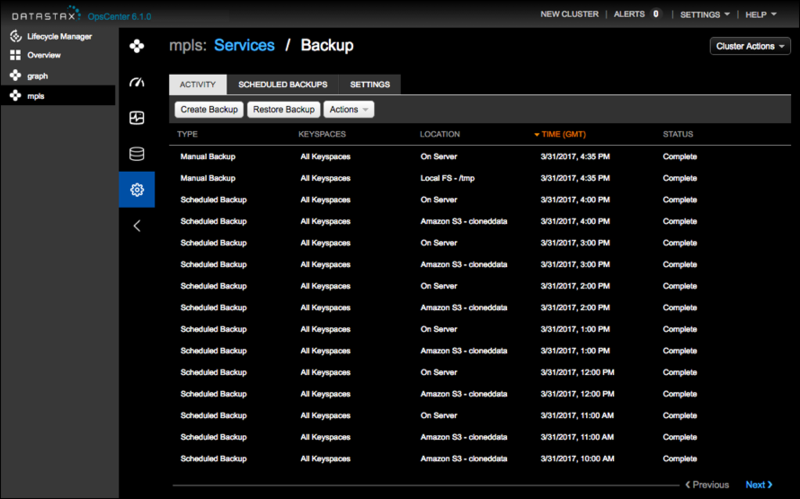 View in-process and completed backup or restore operations in OpsCenter. OpsCenter provides a way to schedule and run backup operations for a DSE cluster. Learn about backing up data to an Amazon S3 or S3-compatible backup location. After upgrading OpsCenter, synchronize the data to populate and refresh past backup history. OpsCenter tracks all in-process and completed backup and restore operations. View the status of the current and recent jobs, page through completed jobs, and view the detailed status of a particular backup or restore operation in the Activity tab. If OpsCenter was recently upgraded, synchronize the backup activity. The details of all completed backup and restore operations are stored in the OpsCenter keyspace in the backup_reports table. The data is stored whether or not the operation was successful. Click the Previous and Next links to peruse backup activity.